"Powerful blasting spray that displaces moisture, cleans and degreases all brake and clutch components without any residue. Effectively dissolves and removes grease, oily dirt, brake fluid, etc. Fast-drying, for easy handling and clean-up. Also, excellent for cleaning electrical components." Galfer DOT4; high performance brake fluid can be used in both sport and race applications. Prevents the formation of vapor even at extreme braking loads. Operating temp to 509f (boiling point). Comes on a 17.64 oz bottle, 500ml. Attach to a hand-held power tool from standard 1/4" shank, it sands the surface like the roll rotor cleaners but last longer per unit. These are quick to clean and utilize Flex Hone technology to produce the ideal surface finish on disc brake rotors and flywheels. This is a new item excellent for cleaning rotors. Course Grit not recommended for most applications (see medium grit above). Speed Bleeders - In Stock!! We can get HD, Norton and Early Triumph upon request (approx. one week wait). Available for single line bolt only. Speed Bleeders: This simplifies installation of brake lines making it a one-person job. They replace your stock bleeders and are kept in. Prior to installing new lines, prime the lines using your old bleeders. Simply clean the area around the old bleeder screw so that no dirt or contaminants can get into the brake system. Screw in the Speed Bleeder® into the wheel cylinder or caliper until it seats. Unscrew the Speed Bleeder® 1/4 to 1/2 turn. Here comes the magical part. Slowly pump the brake pedal approximately 4-5 times. (You do not have to close the bleeder screw between pumps.) A one way check valve lets the air and fluid out when the pedal is pressed and closes between pumps preventing new air from reentering the system between pumps. After bubble-free fluid comes out of the Speed Bleeder® screw, close the Speed Bleeder® until it seats. Proceed to the next wheel cylinder or caliper until all are bled. 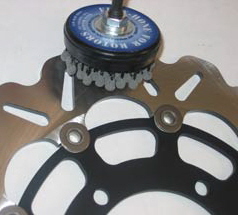 **More tips from fellow riders: Joshua A. wrote "... the speed bleeders on the rear caliper wouldn't bleed out the air. So I reinstalled the stock outside bleeder and bled it till fluid came out then put the speed bleeder back in. Worked fine after that, guessing they needed the pressure of the fluid to open. They work well, however I do recommend doing it the old way of pump and bleed after you get the majority of the air out. Especially if you want ALL of the air out like I do and don't want to kill a bottle of brake fluid doing it." 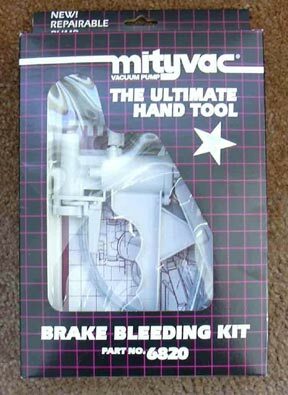 This is the most common way to bleed motorcycle and ATV brakes. It commonly is a two-person process of one person at the brake lever and the other at the caliper. Could be a great project for two buddies (one with experience). Of course, our brake lines require that a licensed motorcycle mechanic install the lines to the torque spec. provided by the manufacturer. If you choose to do your own installation then it is completely at your own risk. After you bleed your brakes the micro-bubbles collect in the master cylinder, trapping the air. The valve on the bleeder bolt is used by opening it and zip-tying the lever in the 'grabbed' position. Let it sit overnight to release the air and then close it up in the morning. These are really popular for people on the race circuit that are 'in the know'. 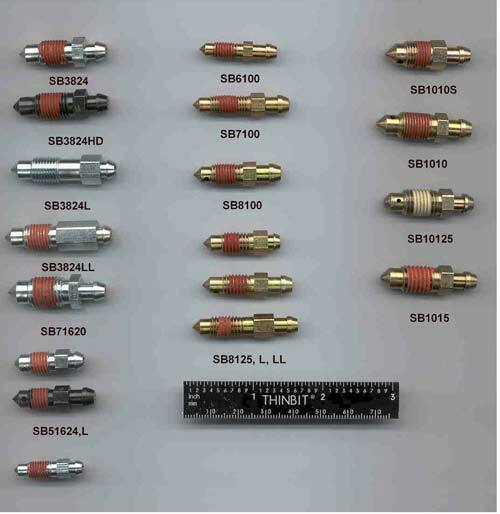 However, they will only work with Galfer brand brake lines because they are shorter than stock bolts. "Just wanted to write a quick thank you. The parts arrived on-time and we got them installed (thanks for the link). The layer of varnish inside the master cylinder was over 1/8" thick in some areas. The brake cleaner we bought from you did a great job at breaking that up. With the master cylinder and front brake caliper rebuilt and the black braided steel line (which looks right at home with the other wires on the front of that old Honda) I think that bike has NEVER had stopping power this good. The speed bleeder made quick work of getting the new system solid. Cyclebrakes.com is a definite "highly recommend" in my book!"